By Otis L. Hairston Jr. 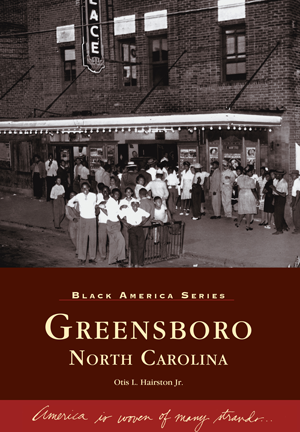 The historic city of Greensboro, North Carolina, experienced national attention on February 1, 1960 when four A&T College students sat down at the Woolworth lunch counter, thus birthing the civil rights "sit-in movements." However, African Americans helped shape the city for many decades prior to that event. Palmer Memorial Institute, the country's first African-American finishing school, is located here, as is Bennett College, one of two historically black colleges for women in the United States. Alumni of Greensboro schools include Ruby Dee, Ossie Davis, the late astronaut Ron McNair, Rev. Jesse Jackson, Justice Henry Frye, and former Harlem Globetrotter Freddie "Curly" Neal. Photographer and author Otis L. Hairston Jr. has documented life in Greensboro, his hometown, for almost 40 years. In this volume, he combines many of his notable photographs with other historic images to chronicle and celebrate the history of African Americans.